Cynthia Carson admits it got quite crowded in her place last November. Indeed, by her count, there were as many as 19 people camping out in her home in Brooklyn, N.Y., including her two children. But this gathering was her idea, so she certainly wasn’t complaining. She had planned carefully, and her only real oversight, if one can call it that, was maybe underestimating what it might take to keep everyone plugged in — thus, there was a trip out to get some power cords. Those powering up were current members of Girls Inc. of Holyoke, most of them high-school students, who were invited to the Big Apple by Carson, the head recruiter for the Nielsen Group’s sports and entertainment division, to do a little sightseeing and a whole lot of learning — about jobs and careers and what it takes to be in those positions, but also about goals and dreams, how to set them, and how to make them reality. Carson, who is quite the role model when it comes to all of the above, having attended both Georgetown and Harvard and spending two years in the Peace Corps in Nicaragua before starting her career, turned her home into a temporary B&B because she had been where her guests were a few decades ago. And she thought the excursion she planned would help them take some big steps forward. Carson found Girls Inc., then the Holyoke Girls Club, more than 30 years ago, when she was in grammar school, and because she did, she also found friends, a different kind of home, mentors, direction, ambition, resilience, and, yes, a desire to give back. Which is why her living room was fully occupied for those few days and she was taking her guests to destinations ranging from the 9/11 Memorial to a co-working facility bristling with tech startups, to Times Square. 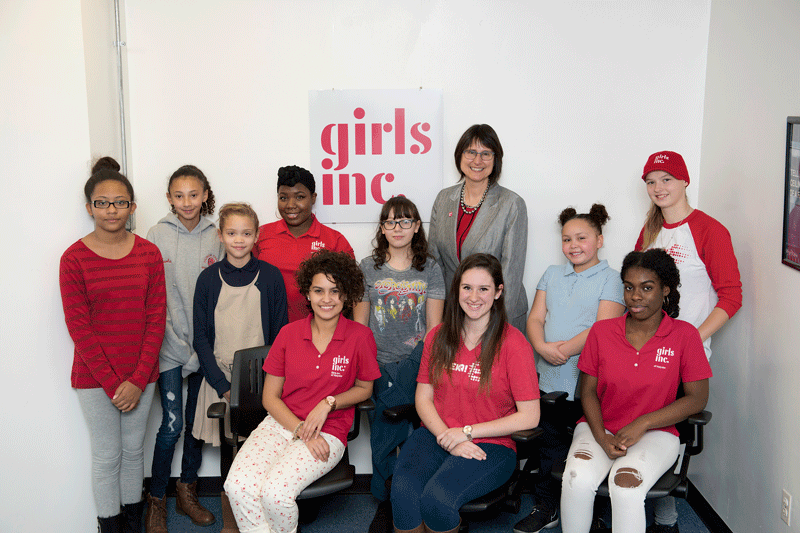 We’ll be going back to New York, figuratively, a few more times in the course of explaining why Girls Inc. of Holyoke was chosen as a Difference Maker for 2018, because that visit represents a microcosm of not only its mission — to inspire girls to be strong, smart, and bold — but also how it goes about it carrying it out. But we’ll spend most of our time at Open Square in Holyoke, where many Girls Inc. programs are based and where BusinessWest talked with several members. And we’ll also travel (again figuratively) to UMass Amherst, where an ambitious program called Eureka is not only introducing girls to STEM (science, technology, engineering, and math) careers, but giving them a taste of what they’re like and what they will need to know to thrive in such settings. It does so through introductions to more role models, but also specific programs with titles like “Making Protein Glow in the Dark,” “Melting Ice and Rising Seas: What Does the Future Have in Store for Us?” and “Is there a Connection Between Breast Cancer and the Environment?” More on all that later. Overall, Girls Inc., a national agency with 92 affiliates across the country, exists because there is a need for organizations that focus on that specific constituency, said Suzanne Parker, executive director of the Holyoke chapter, adding that one needs only to look at the headlines locally, regionally, and nationally to understand why. 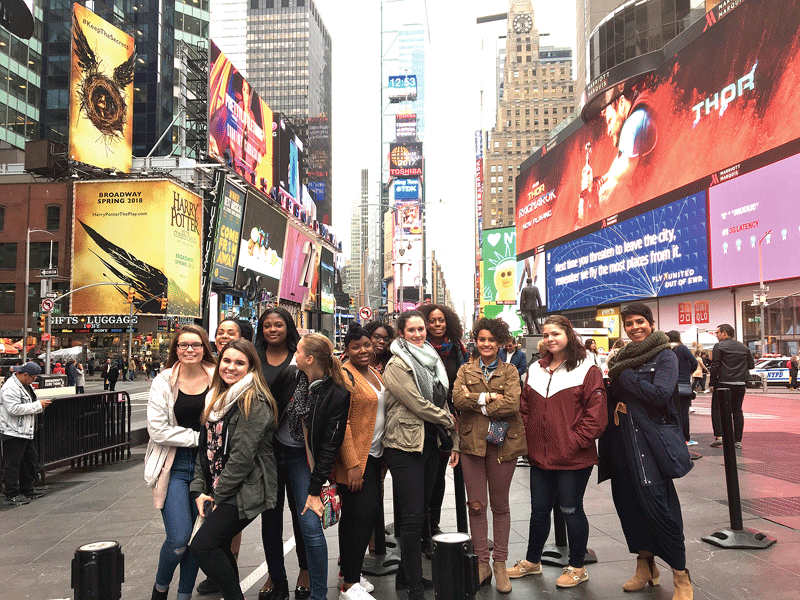 Cynthia Carson, far right, leads her guests on a tour of Times Square, one of many spots visited during a trip designed to inspire and educate the young ambassadors from Girls Inc. of Holyoke. “We know that girls face an inordinate number of challenges and obstacles, everything from bullying and harassment to low expectations in their community,” she explained. “We know that, across the country, one in five girls is living in poverty, so girls living in neighborhoods without a lot of resources are facing a number of challenges. The nonprofit addresses those statistics in a number of ways, but especially through programming that helps girls of all ages make connections, gain confidence, find direction, create ambitious goals, and discover the resolve to meet them. Its ability to succeed with these goals is evidenced by the sentiments expressed by some of the girls we met. Individuals like Emahnie Maldonado, 18, a senior at Chicopee High School, who has her sights set on the difficult physician’s assistant program at Springfield College. She summed up the Girls Inc. experience (we’ll hear that phrase again later) concisely and efficiently. When asked where she lived in Holyoke growing up, Carson paused for a minute, because while for most that would have been a short answer, for her it wasn’t. Between the ages 5 and 11 or so, she went to the Girls Club, took part in several sports programs, and went on a number of trips, to farms and other locations. And she looks back on those activities as a way to close some of the “economic separation” that she could already recognize taking place in that community. You won’t see that wording on the Girls Inc. mission statement or anywhere on the Web site, but that is essentially what it was created to do — become that structural help that Carson noted is so often missing among children like her. The Holyoke chapter, one of eight in Massachusetts, focuses its energies on girls living in low-income neighborhoods where resources are scarce. It currently serves more than 350 members, many of them from Holyoke, but there are a growing number from both Springfield and Chicopee, and Parker expects the numbers to continue to rise as awareness and positive referrals both increase. But the nonprofit impacts the lives of all girls through advocacy, she went on, adding, again, that it exists to meet the specific wants and needs of girls, and there is certainly room (and demand) for such an organization regionally and nationally. 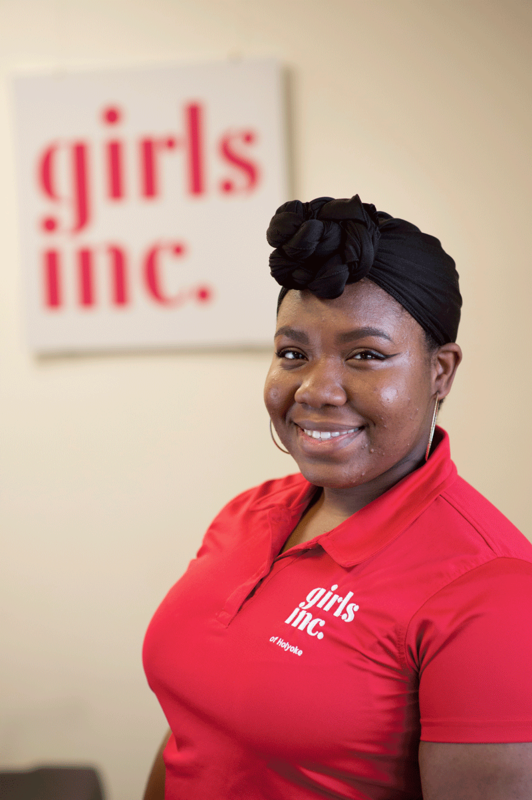 To explain why, she refers to that ‘Girls Inc. Experience,’ which is created through a mix of staff, a girls-only environment, and programming. “We have highly trained professional youth-development staff who understand the needs of girls and are trained to work to provide mentoring relationships with the girls so the girls know they have trusting adults in their lives they can go to, whether it’s issues or challenges they’re dealing with,” she explained, adding that this element separates Girls Inc. from other youth-focused organizations. As for the girls-only environment, it amounts to a “safe space,” as she called it, not available in most other settings. • Health, Wellness, and Sexuality. Carson told BusinessWest there were several motivations for the road trip to New York. First, there was the desire to give back to the organization that had been so important to her growing up — something she had already done in several ways, including her role as keynote speaker at its annual fund-raising breakfast last October. But there was more to it. She said she had nagging questions about whether, overall, girls were being compelled to reach high enough and push themselves hard enough to succeed in a rapidly changing, increasingly competitive world, especially within the STEM universe. 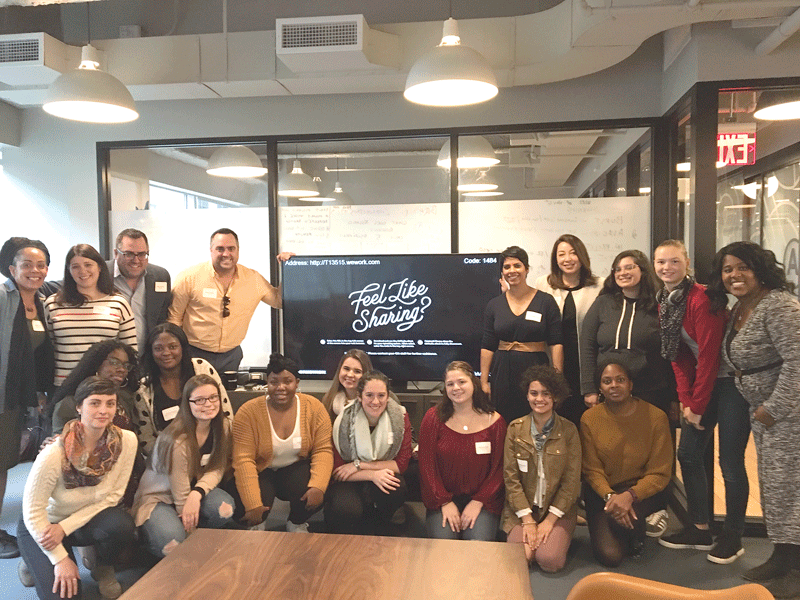 Members of Girls Inc. in Holyoke pose for a group shot with tech-industry representatives at one of the WeWork buildings in Manhattan during their recent visit to New York. So she put together a jam-packed Tech Day, which was actually two days. Students met a number of women, including two who grew up Holyoke, in various STEM careers, with the goal of making sure the visitors returned to Western Mass. with a full appreciation of the depth of careers available to them — and what it would take to enter those fields and succeed there. One stop was to one of the WeWork buildings in Manhattan, a co-working space. There, a panel of women working in the tech field for both companies they started themselves and giants like BuzzFeed, talked about not only their work, but the adversity many of them overcame to get where they were. “They spoke about what it was like to be a woman and a woman of color in the tech world,” said Parker, adding that the visitors also met individuals who made it from the same streets in Holyoke they grew up on to the highly competitive environment in New York. To say that the trip as a whole, and especially Tech Day, made an impression would be an understatement. In essence, the Eureka program was created with the same basic intent — to inspire girls and compel them to reach higher, while understanding the hard work it will take to get there. This national initiative is a five-year program that girls enter when they’re in the eighth grade. It’s a year-round endeavor (with ‘Eureka Saturdays’ in the winter, spring, and fall), but really picks up steam in the summer. And it’s carried out in conjunction with the College of Natural Sciences at UMass, which, as Parker put it, “rolled out the maroon carpet” for the Girls Inc. members. Elaborating, she said roughly half the hours devoted to Eureka are spent in STEM workshops in labs and other facilities across the UMass Amherst campus, including the Polymer Science Center and the Integrated Science Building. The Eureka program was conceptualized to generate interest in STEM careers still dominated by men — and keep girls interested, said Parker, noting that, while it’s still relatively early when it comes to quantifying its impact, there are already many positive signs. “Some of the early indicators are strong and positive,” she told BusinessWest. “Girls are saying, ‘I’ll take a harder class,’ because they know if they don’t take algebra and do well in it, they’re not going to go on to college. There are qualitative measures as well, including the comments of some of the Girls Inc. members who spoke with BusinessWest. Kayah Brown, 16, for example, now has ambitions to become a reconstructive plastic surgeon, a career path inspired in part by her grandmother’s battle with breast cancer, but especially by an externship at the Pioneer Valley Life Sciences Institute she garnered through the Eureka program. Inspired by her grandmother’s battle with breast cancer, Kayah Brown has set her sights on becoming a reconstructive surgeon. 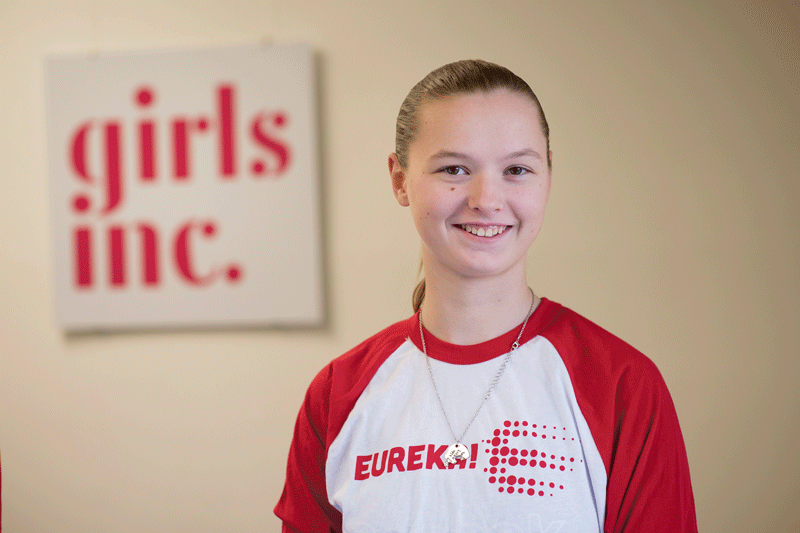 “I was able to meet some of the breast surgeons at Baystate Medical Center and talked with them about what led them to become surgeons,” said Brown, a student at the MacDuffie School in Granby, adding that, through Girls Inc. and Eureka, she has gained not only insight into the wide spectrum of STEM careers, but the confidence to consider that path. Her sister, Sabria, 18, a senior at MacDuffie, echoed those thoughts. Elaborating, she said her app is for businesses and schools, and it amounts to a digital lost-and-found service. While she has high hopes for it, she’s more focused on getting more women of color into STEM careers and computer science in particular. Interest in STEM was one of the many common threads that ran through comments offered by nearly a dozen girls, ages 9 to 18. The words heard most often were ‘friends’ — they’ve all made some through their participation; ‘home’ — that’s what the facility itself has become to many; ‘confidence’ — a quality nearly every one of those who spoke said they have more of because of Girls Inc., and ‘support’ — something the nonprofit, its leaders, and fellow members have provided in myriad ways. Meanwhile, they collectively talked about visits to farms, art galleries, museums, and a host of other destinations chosen to both educate and inspire. Carla Lopez, 12, a student at Sullivan School in Holyoke, told a story that many sitting around the conference-room table could relate to. She came to Girls Inc. at age 7. Her parents were divorced, and her mother, who worked full-time, brought her to Girls Inc. in hopes that she would find friends, make connections, and fill the hours until she came home from work with meaningful, educational experiences. “At first, I thought it was an ordinary program where you colored, built with blocks, and lot of other simple stuff,” she recalled, turning the clock back almost half her lifetime. “But it took my life to a new level; we learned coding, we went swimming, we’ve been on a whole bunch of field trips. “There are a lot of girls here who are just like you, and they’re experiencing the same things as you,” she went on, adding that facing these issues and challenges together makes them less daunting, especially with the support of staff members. As for Stella Cabrera, 18, a senior at Holyoke High School, she’s probably the longest-tenured member of the Holyoke chapter, having started there seven years ago. She’s looking at the ROTC program at UMass Amherst and, longer-term, at a career in the military as a biochemist. Thanks to experiences made possible by the Eureka program, Stella Cabrera has her sights set on being a biochemist. She said she came to Girls Inc. after heavy lobbying by her mother, because she was bullied at the YMCA. She found a group of girls and a corps of staffers focused on building her up, not tearing her down. Returning to Gotham one more time, Carson said that, as one might expect, New York was itself a sometimes intimidating learning experience for the young women who went on the trip, right down to the subway system — and the challenging feat of getting 17 people on at the same time. But after only a little while, the visitors were starting to become familiar in their new environment and master its intricacies, including the subway itself. Life certainly won’t be as easy as leading a group of friends down to a subway station, but the analogy works on many levels, including the most simple of them — finding one’s way and getting to where one wants to go. It happened on a subway in New York, and thanks to Girls Inc. — a true Difference Maker in every sense of that phrase — it can, and does, happen in life itself.